First They Came for the Immigrants - And Now What Will YOU Do? And Now What Will YOU Do? 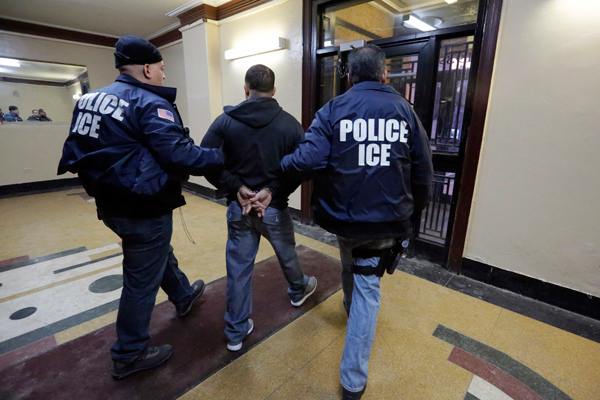 ICE agents arrest an alleged undocumented immigrant in New York City, March 2015. In the U.S. you have many different nationalities of people, and one of the key factors in making a revolution in this country is going to be developing the struggle, including among white people, to take on and uproot the whole history of oppression of Black people, Puerto Ricans, Chicanos, Native Americans, Asians, and so on. You are never going to make a revolution in this country without that being central and pivotal. But you're also never going to make a revolution without a vanguard that bases itself on a scientific approach to these questions—and to every other decisive question—a vanguard in which everybody contributes and struggles with each other on the basis of striving to grasp that scientific approach, and on that basis battles out what is required to make revolution and to transform society and the world, to put an end to all oppression. First they came for the people of Muslim faith, banning them from entering this country. Then they came for the millions of people from Mexico and the rest of Latin America living and working in this country without documents, unleashing their pigs to hunt them down, round them up, and deport them. Deportations under Obama had already reached record proportions, and so had the number of Border Patrol agents. But the Trump/Pence regime is taking this war to a new level. Millions of people are living under police-state conditions, with an atmosphere of terror spreading. 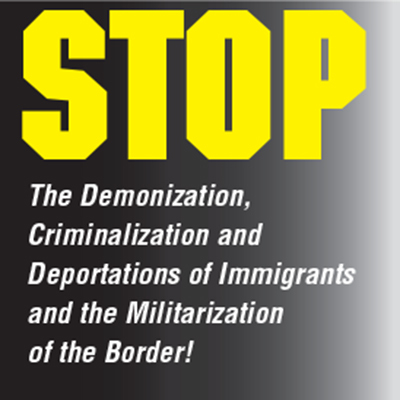 Documented and undocumented immigrants are demonized, painted as “criminal aliens” and treated as suspects, often denied basic rights—and their humanity. ICE (Immigration and Custom Enforcement) agents carry out storm trooper raids and roundups, any time and any place, against people whose only “crime” is to come to this country to work and survive. Families are being torn apart, children ripped from their parents. Mob violence and hate crimes are whipped up and let loose. Anyone with a shred of humanity should be horrified by these savage, inhuman assaults. And more is on its way as the numbers of immigration courts and judges and ICE and Border Patrol agents are dramatically increased. Sanctuary cities are being threatened, to stop them from blocking the incorporation of local and state police into a national force to hunt down immigrants. The escalating scale of deportations, including deporting refugees to countries like Guatemala, Honduras, and El Salvador, means many will face certain death. All this is crossing into new territory that is a hallmark of fascist regimes: one section of society is separated and isolated, forced to live a life in the shadows, fearing any interaction with an authority who can make them prove they have a legal right to carry out normal, everyday activities. In the fascist vision of society, those who cannot produce “papers” are caught between persecution and demonization, and face imprisonment and deportation at any moment. A society where expressions of outrage and resistance are met with brutal repression. This march toward fascism cannot be allowed to continue—mass resistance is absolutely crucial. And it must be aimed at driving out this fascist regime. May First is a crucial time to take to the streets. Refuse Fascism is calling on people to join in the protests in cities around the country for immigrant rights and against the widespread roundups and deportations. Refuse Fascism is organizing contingents and calling on many to join, to make a powerful statement with the big “NO!” on signs and banners with the slogan: NO! In the Name of Humanity, We REFUSE to Accept a Fascist America! Drive Out the Trump/Pence Regime! At the same time, to put an end to the war on immigrants and all of the horrors this system itself has created, our sights must be set on revolution. This system of capitalism-imperialism cannot be reformed. White supremacy and the brutal exploitation and demonization of immigrants are sewn into its fabric and its history. It feeds on the super-exploitation of the most oppressed like a vampire on blood. Only an actual revolution that brings about a new society with a whole new economic system, politics, and relations between people can lead to the fundamental change that is needed. There is a strategy for this revolution, and a way to actually defeat the system. And there is a vision and plan for a radically different, and profoundly liberating, society: the Constitution for the New Socialist Republic in North America, authored by Bob Avakian and adopted by the Central Committee of the Revolutionary Communist Party, USA. This is a plan for a revolutionary society full of vibrant diversity, critical thinking, creativity, and internationalism. A society aiming for a communist world—without one part of society ruling over others, without countries and borders, without all the oppressive relations and ideas that imprison humanity today. In this revolutionary struggle, and its victory, large numbers of immigrants, as well as masses of Black people and other oppressed nationalities within the former imperialist USA, played a crucial role, and they can and must continue to play a vital part in the continuing transformation of society, and the world as a whole, as part of the backbone of the New Socialist Republic in North America. Get into this radical step into the future!